We’d love your help. 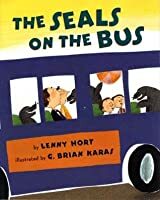 Let us know what’s wrong with this preview of The Seals on the Bus by Lenny Hort. Two children and their parents board a city bus on their way to a party. At the next stop, who should get on but a group of seals, who holler "errp, errp, errp" at th This hilarious new version of the beloved children's song "The Wheels on the Bus" will have young readers errping and roaring and honking along. To ask other readers questions about The Seals on the Bus, please sign up. Worked well for baby rhyme time, but probably better for those a little older. With my group, I usually have several older siblings, so it was still good for the whole crowd. I really enjoyed this book. The illustrations are my favorite part, with the looks of terror and surprise on everyone's faces at all the animals on the bus. And also at the end when the adults say, "help, help, help!". Very funny. Fun book to make animal noises to. However, I was a bit let down when I realized that it wasn't just the seals on the bus. The other animals....boring. A busload of seals would have made such a better story. Ha! Oh my goodness, do my students ever love this book! It is a great read-aloud/sharing story that will have everyone singing. This is perfect for Animal Sounds! Fun, engaging, and playing on a familiar song. The pictures are as entertaining as the idea each page brings across. 3/2/10 & 3/4/10: Both groups loved this book. Parents sang along in both groups. The larger Tuesday crowd got a little riled from it, but they really enjoyed it. With the smaller Thursday group I had learned to slow down and ask some questions to involve the children even more than in just the singing of the new sounds. (And the shy girl sang This is perfect for Animal Sounds! Fun, engaging, and playing on a familiar song. The pictures are as entertaining as the idea each page brings across. 3/2/10 & 3/4/10: Both groups loved this book. Parents sang along in both groups. The larger Tuesday crowd got a little riled from it, but they really enjoyed it. With the smaller Thursday group I had learned to slow down and ask some questions to involve the children even more than in just the singing of the new sounds. (And the shy girl sang along the whole time!) My throat is definitely feeling the after-effects of trying to sing Roars, Eeehs, Baaas, and Sssses. 2/22/12 For a "Let's Laugh" theme, these kids caught on immediately with the title being different. They were very much into joining me on the animals sounds. A couple in the first, larger group sang along with me, but most were happy with making the sounds and looking at the pictures. Good thing the book was easy to remember, because then I could just keep showing the pictures instead of having to put the book to the side with each page turn so I could read it. I didn't sing extremely loudly in either storytime, because I wanted to save my voice. But the kids were enthusiastic enough in joining that I didn't need to worry about that. 2/19/14: For "That's Crazy" theme. All the books were good, but this may have been the favorite because you could sing the song. And they loved singing along to it. Hard to tell which animal was their favorite, but their faces with the vipers was priceless. This book gets a really strong 4 from me. It's a good quality book and story. I enjoyed the book, at the same time, it didn't blow me over either... But it's definitely a book I could see having fun reading to - and with - preschoolers or kindergartners. 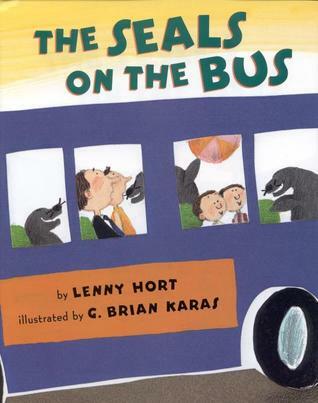 As one might expect from the book's title, "The Seals on the Bus" is a play on the traditionally well-know children's song - "The Wheels on the Bus". I like how this book uses animals (and animal sounds and noises) to enhance this particular bus This book gets a really strong 4 from me. It's a good quality book and story. I enjoyed the book, at the same time, it didn't blow me over either... But it's definitely a book I could see having fun reading to - and with - preschoolers or kindergartners. 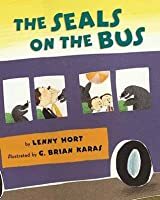 As one might expect from the book's title, "The Seals on the Bus" is a play on the traditionally well-know children's song - "The Wheels on the Bus". I like how this book uses animals (and animal sounds and noises) to enhance this particular bus ride - the story. I think it's well-written and simple to follow. Also, the illustrations are solid. * It was fun to see the several different animals this book included. By the title - and cover - it would appear there are just people and seals on the bus. This is far from true. As you read, and as the bus makes each stop, other animals join the mix. I could see young kids really getting a kick out of this! * I like the spacing and the font used in "The Seals on the Bus". The large font, accompanying clearly drawn illustrations (thorough, yet not overly busy in my opinion) make it very clean and easy to follow. Brief summary A bus full of animals retell the classic wheels on the bus. Print Motivation - This is a fun story to retell and sing. Phonological awareness - the sing song rhythm makes it easy to hear the various sounds. Opinion - This is a fun book to read aloud and you can add animals if you like but it is pretty Brief summary A bus full of animals retell the classic wheels on the bus. Opinion - This is a fun book to read aloud and you can add animals if you like but it is pretty good the way it is. A rollicking ride on the bus with animals! Different animals--including seals, tigers, geese, rabbits, monkeys, and more--make their own sounds as they ride all around the town on a bus. Awesome to use in Storytime! This book is for ages pre-k to first grade. This book takes a classic nursery rhyme and turns it into something new. This book is all about different types of animals including seals, geese, rabbits, skunks and more that go onto the bus. The book still has the same rhyme pattern as the original but it just as animals in it. This is a fun book to have and it can be very interactive with the students. One thing the book doesn't mention is where are all these animals going. Are they going No awards. This book takes a classic nursery rhyme and turns it into something new. This book is all about different types of animals including seals, geese, rabbits, skunks and more that go onto the bus. The book still has the same rhyme pattern as the original but it just as animals in it. This is a fun book to have and it can be very interactive with the students. One thing the book doesn't mention is where are all these animals going. Are they going just for a ride or do they have a place to be? Either way this is a fun book to read! This book is a great spin on the classic nursery rhyme The Wheels On The Bus. It is different than the original and it makes it more fun to read. I also like how on every page when a different animals comes on the bus the people have different reactions to each one. When the sheep came on the bus the people were so happy and laid on the fluffy sheep fur. But when the skunks came on the bus the people looked like they were going to be sick because it smelled so bad. Having this book be turned into something different than the original nursery rhyme makes it more unique and fun. What fun! A new adventure for those familiar with the routine Wheels on the Bus. Now we have different animals whose additions crowd the bus with their noises and presence causing the adults to plead for help at the end. The kids know the story so it is easy for them to jump in and produce the sounds. The pictures of the animals squishing the people on the bus and causing a ruckus like the skunks and snakes was very funny. I would not want to be the bus driver on that run. Cute children's story about all kinds of animals and how their sounds and actions in the bus make them go all around the town. Children will like learning what sounds the animals make. I LOVE this book!!!!! It's a fun rewrite to the Wheels on the bus that everyone will enjoy! I plan on reading this to my Toddler Tales this summer during Summer Quest (Summer Reading). The illustrations are great as well! I love the characters faces when something goes wrong. Great story time read! Summary: Everyone knows "The wheels on the bus". This is an adorable version that has cute little seals. Perfect for young children. Review: A sweet little twist on a classic song for children. It has adorable illustrations. Definitely a good book. Such a cute book. This would be great for a story time, if the kids in the group like to interact with the books. You could get them to make the noises along with the animals. And the kids at my library LOVE The Wheels on the Bus, so this might be making an appearance at my story time soon! Good story time read aloud - everyone already knows this tune! Fun animal noises, and the twist ending is great. Even at baby toddler story time, someone can usually point out why the people on the bus might want help! Same as wheels on the bus, but with different animals. Great for animal sounds. Good for toddlers. Great for a future storytime. Very fun animals. The skunks one is a little weird but I can't roll with it. Love animal sounds! Any book you can sing is great for storytime. Wheels on the bus with a variety of animals! This book is more of a fun read for early elementary, especially because of the repetitive words. I would say this book is more for illustration. Very cute! To the tune of "Wheels on the Bus", a number of animals climb aboard on their way to a party. They make their various animal sounds. Children will enjoy the silliness of this one. Ooooh this one is fun! Funny retelling of the song "Wheels on the Bus" - but the bus is full of animals! I love to sing during storytime, and this one is great! Kids love making the animal noises.